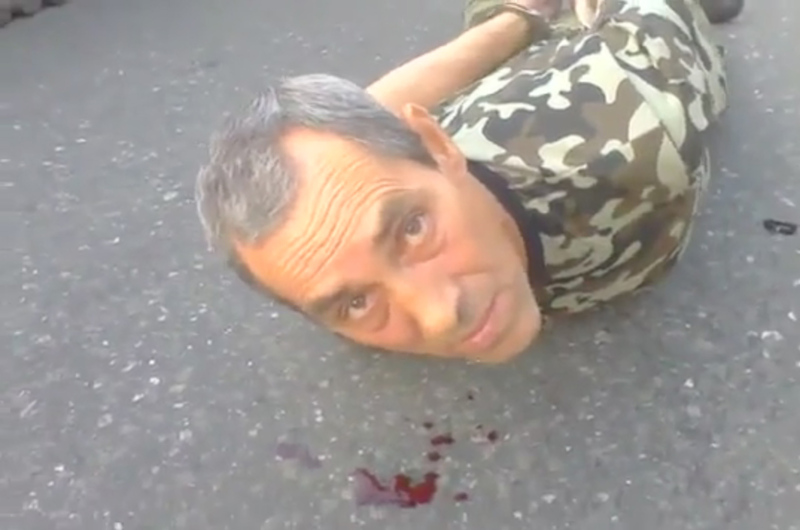 Putin@war: Evidence of POW torture and trying to blame Ukraine for it. 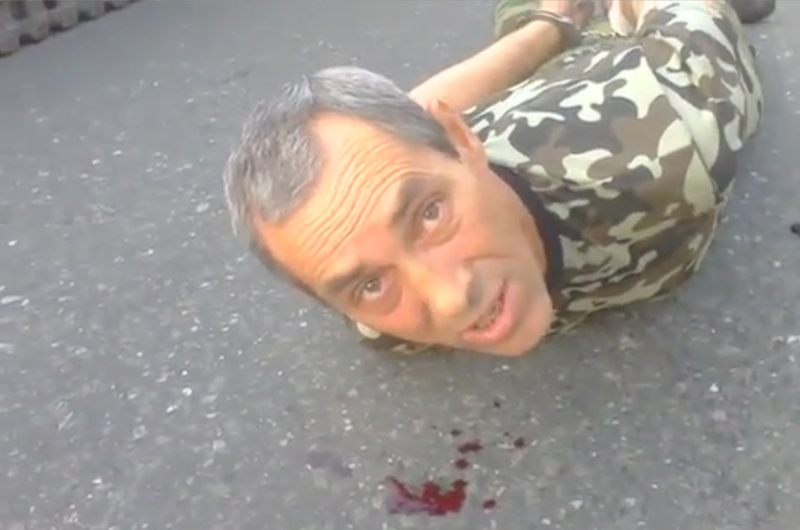 Evidence of POW torture and trying to blame Ukraine for it. 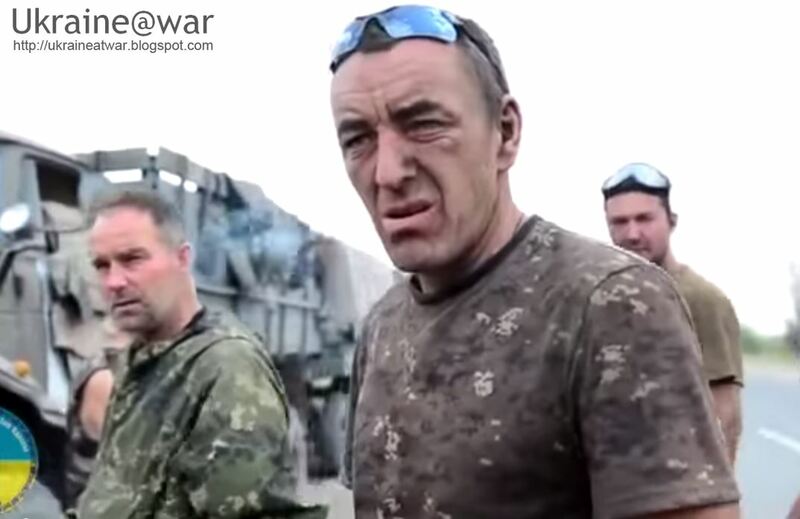 Understand that in the second video the man just came back from weeks of intense shelling. He is exhausted, dirty, underfed and anger and frustration are written on his face. 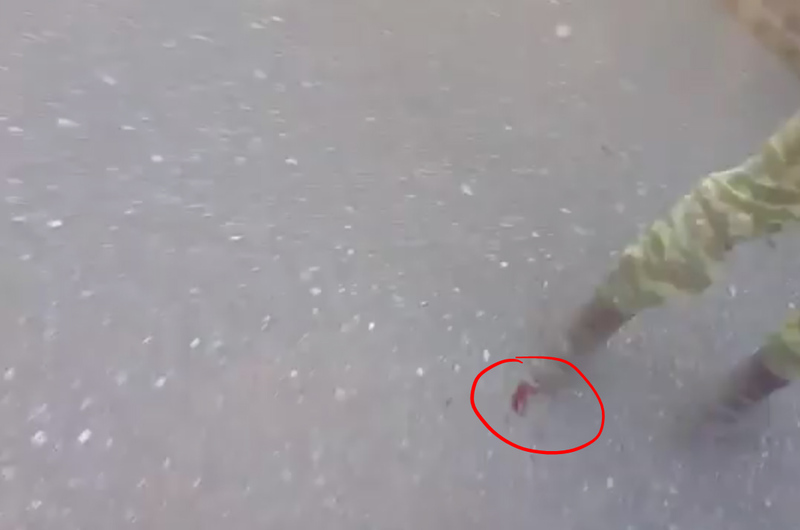 In the second video he must have recently returned to the battlefield. He has slept well, eaten well and is physically fit again. 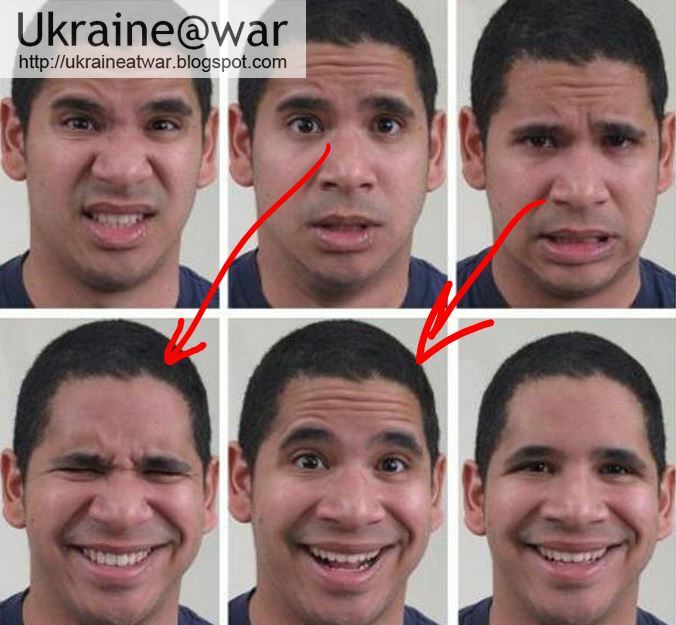 Frowning down (left arrow) or frowning up (right arrow) explains the different wrinkles on the mans face. 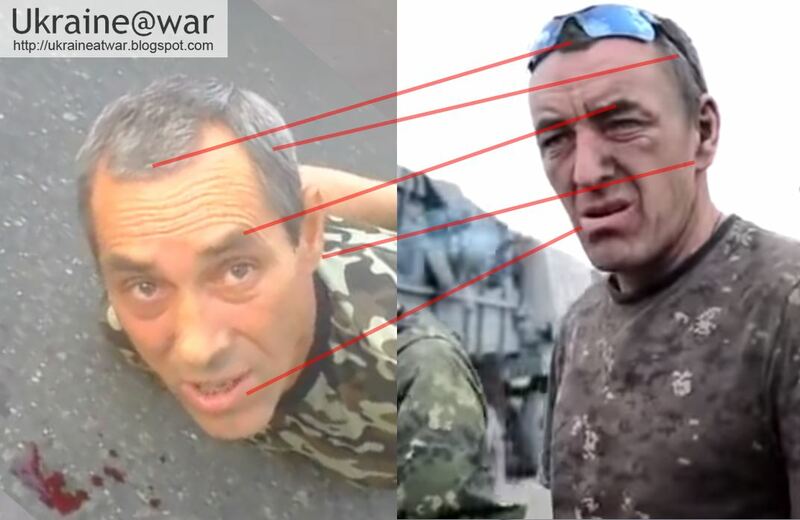 In the image above the nose can also be compared well. See how his nostril has the same curve. His two upper front teeth are turned a little bit at an angle to the inside. When his teeth are put together it colors a little bit dark in both videos. 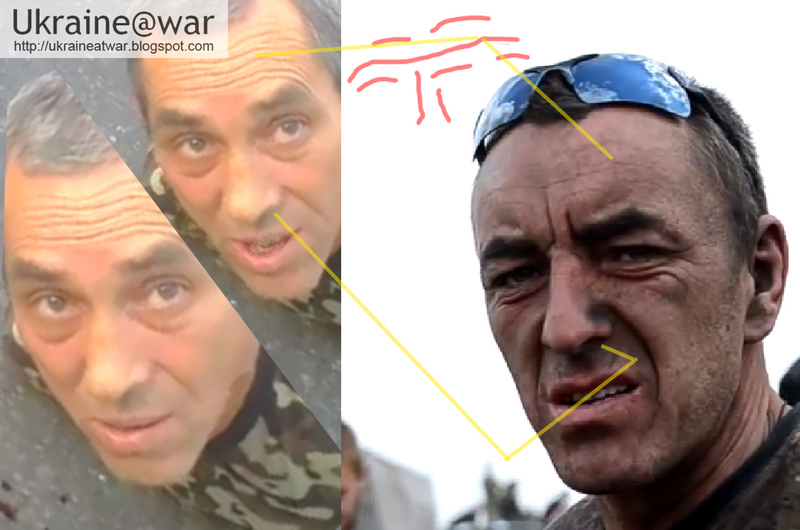 His right lower front teeth (for us on the left) are shifted a bit forward, which can be seen in both videos. 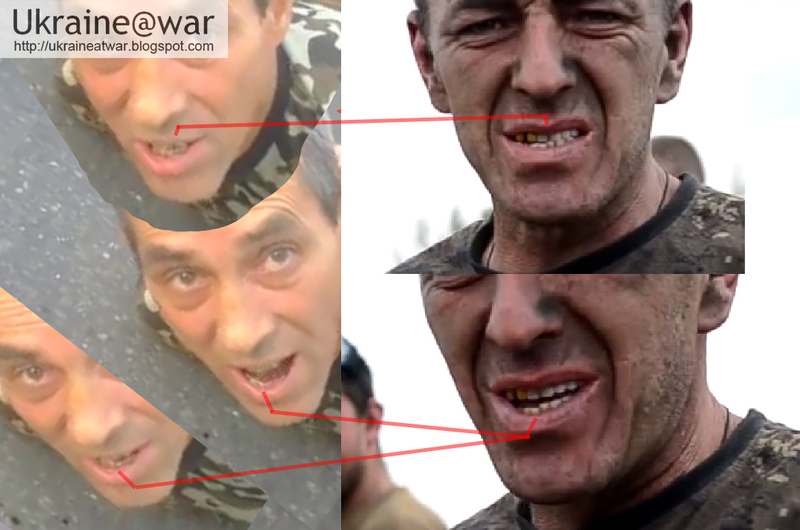 Since teeth are like fingerprints, this is a clear indication that it is the same man. 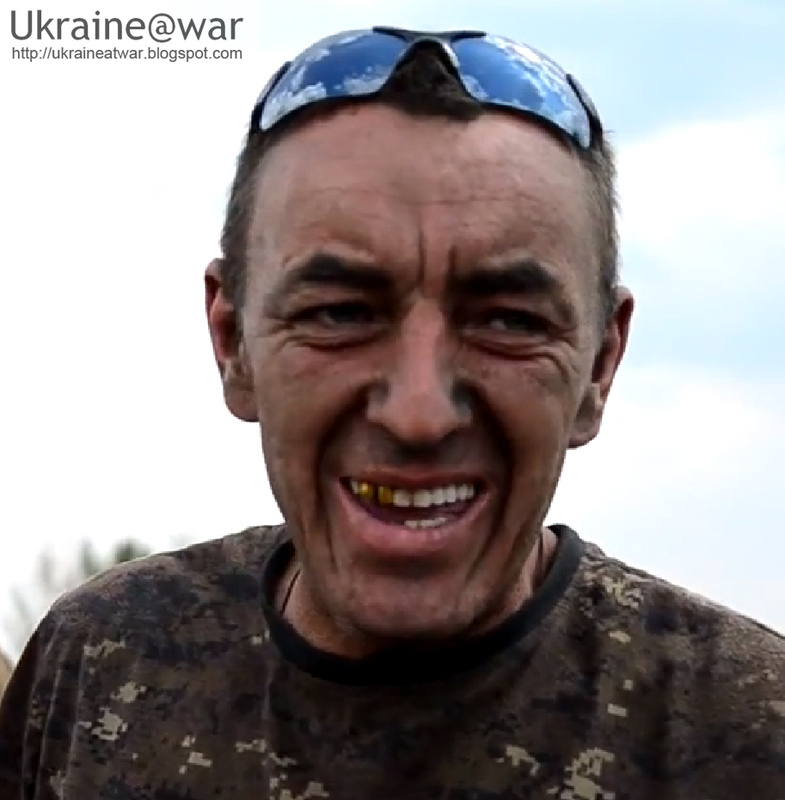 So unless this Ukrainian man has a twin-brother that serves the Russians (and the same dentist), this is the same man. 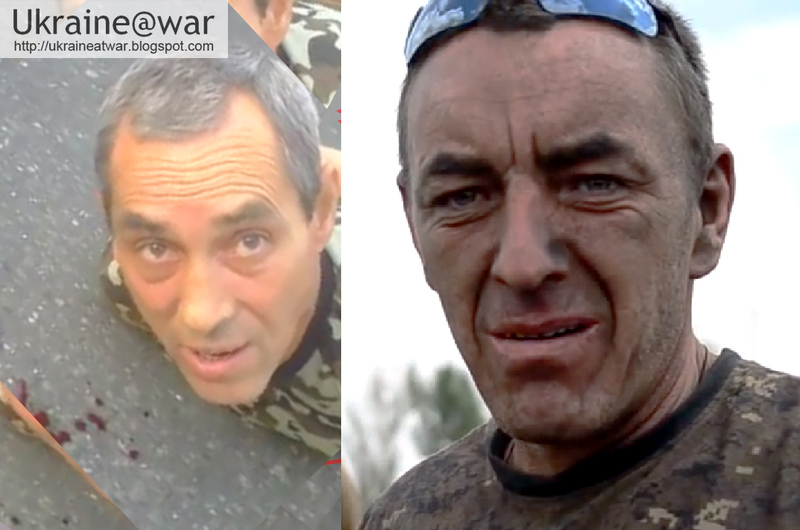 How can a soldier from 72th brigade end up in Ilovaisk where the 72th is not fighting? A lot of people from 30th brigade are missing in action. Which means they were either killed or captured. When captured there is an extreme high risk that they get killed too. 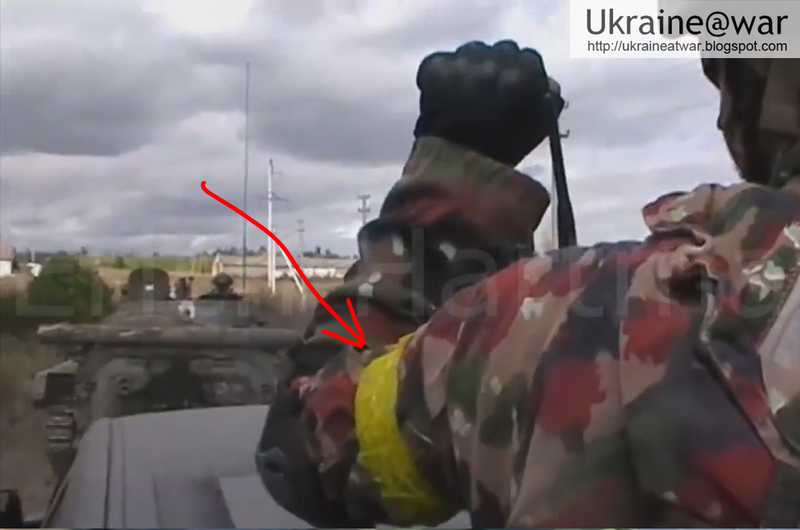 So, this means this POW is UKRAINIAN and not a local proRussian separatist. If you still believe these guys are NOT the same, help me identify both/all, because their lives may depend on it. I'd rather sound the alarm and be wrong afterwards and having to admit that, then NOT sound the alarm and after two weeks we find these people dead. You understand me? So help me identify them. The other pretending-to-be Ukrainians lack such bands too. 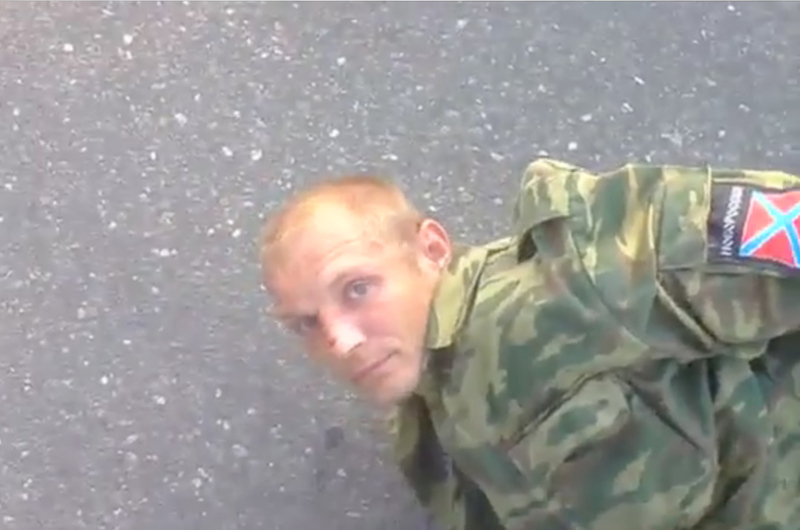 Note the scrape on his nose from forcefully pushing his face to the street. 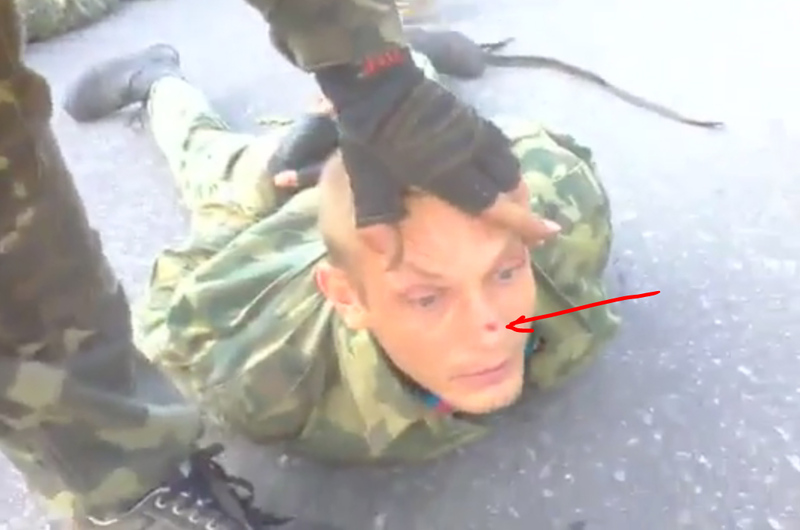 A wound on his face cannot be seen. Yet he may be hit in the face and bleeding from the nose. 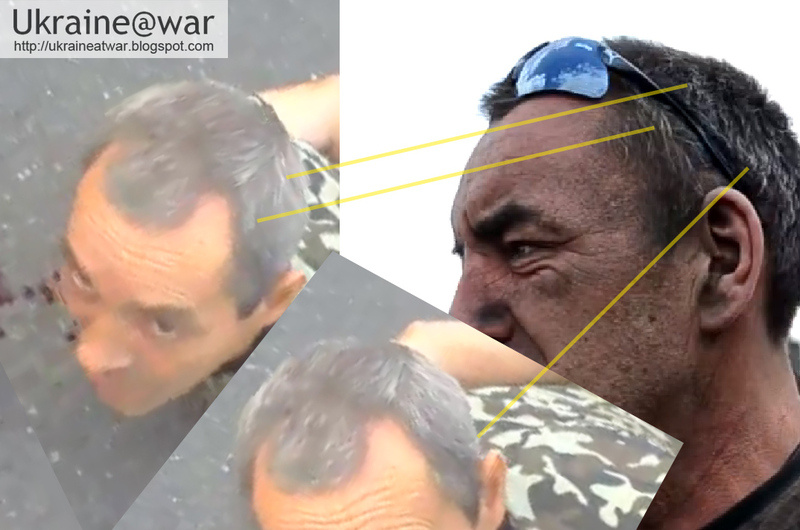 The left side of his face is not seen, nor the bottom of his nose. 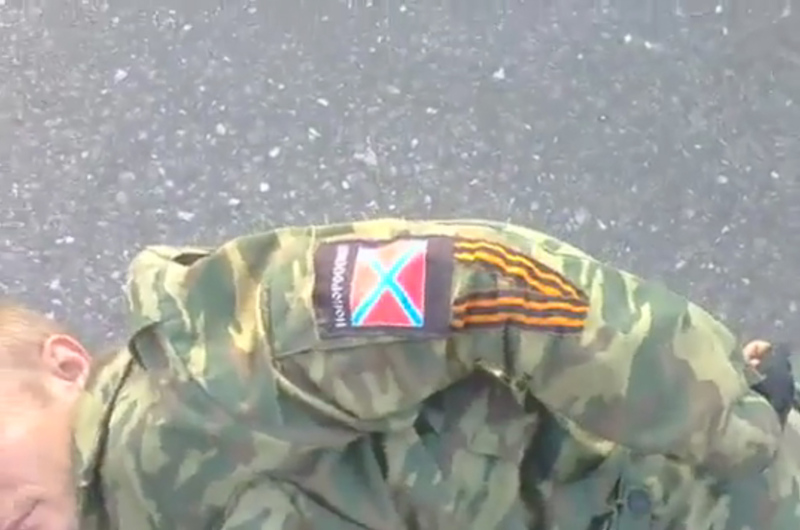 This Novorossyia logo must either haven been pasted to his jacket, or he had been forced to put on other clothing, to look like they have been captured by Ukrainians. which will later be used to tie his hands. You can hear shots on the background. 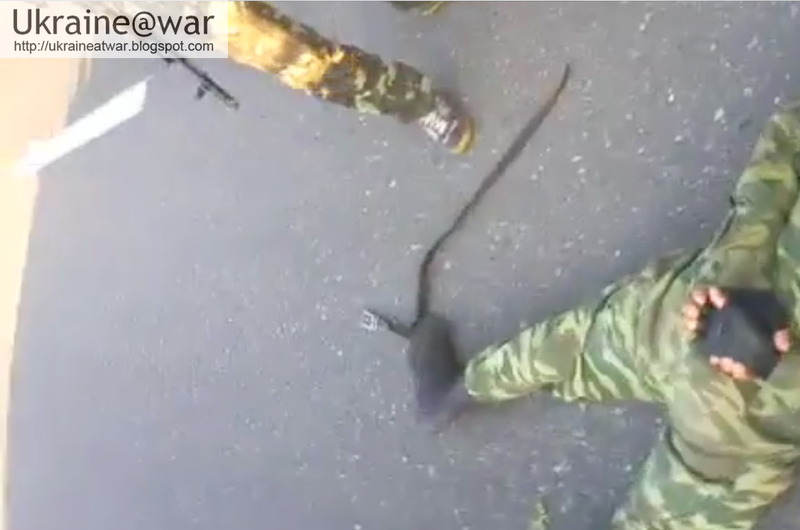 It may very well be possible that other Ukrainian soldiers are executed while recording this video. 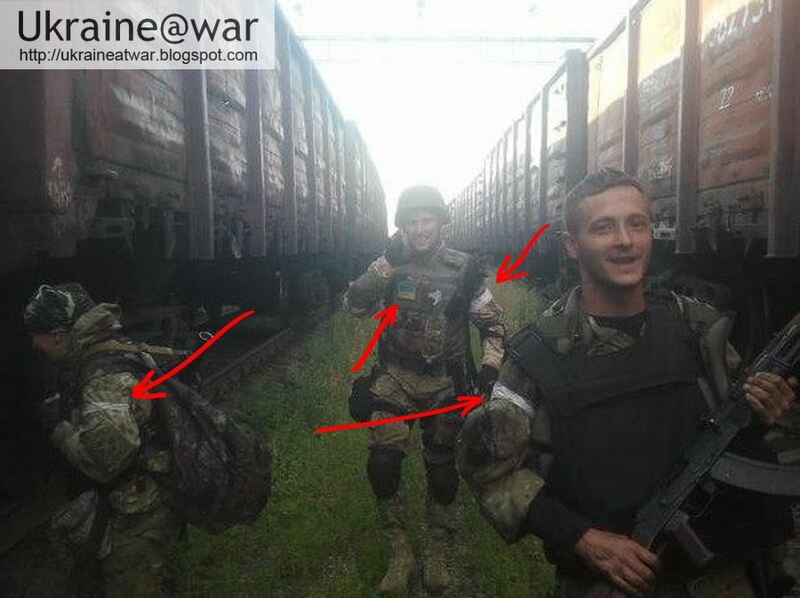 He probably is regular Russian army soldier, maybe Chechen. If you recognize any of these people and have more information, please let me know as soon as possible. Also maybe this car can be identified or seen in other videos? The number plate seems to be AH 0244 IE. These POWs may be killed if they stay out of media attention. 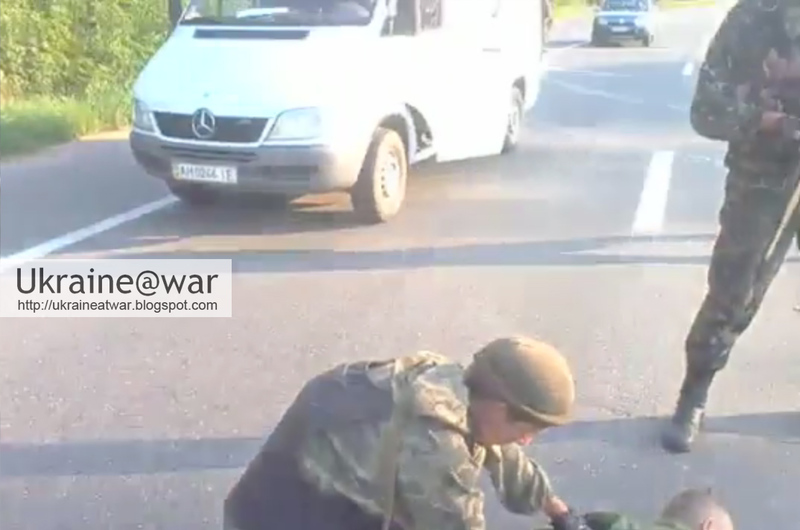 Also see: How Terrorussians tried to blow up the car with Ukrainian POWs AFTER they were exchanged for Russian POWs. 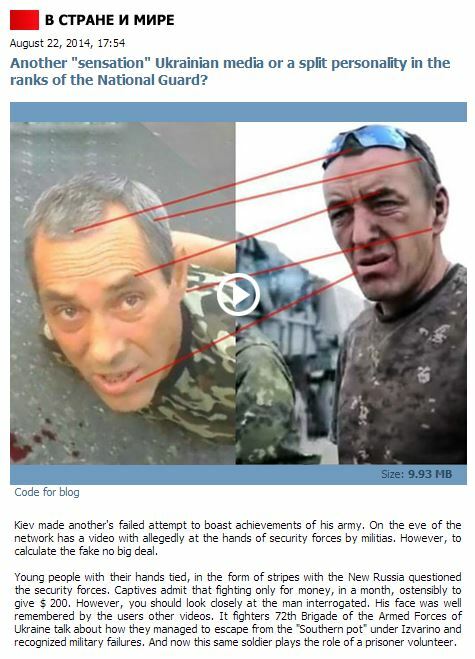 A Russian TV-station has picked up the issue to give it their own twisted turn again. 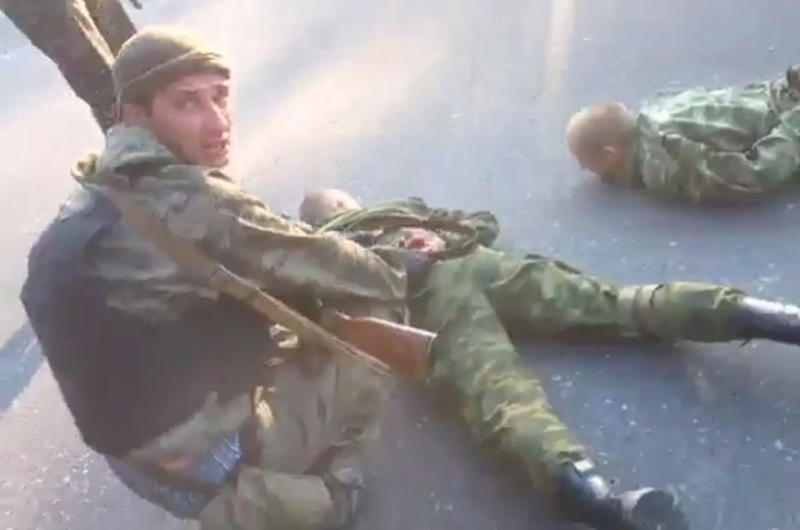 They say the Ukrainians made the video, but the captured Russians were actually their own soldiers, since that one man was seen in the earlier video. The article including their tv-item can be found here. In response to this Stopfake.org published an article saying this is NOT the same man. Neither site refers to my blog for people to read the whole story. Still we haven't heard anything of the true identity of any of the POWs or the soldier from 72th. First POW answered the question: "How much do You receive (earn)? - 200 bax (USD) per month?" what is unusual. Ukrainian would answer in hryvnia. Other questions were asked in strange manner: "Why have You come? Don't You have a family? 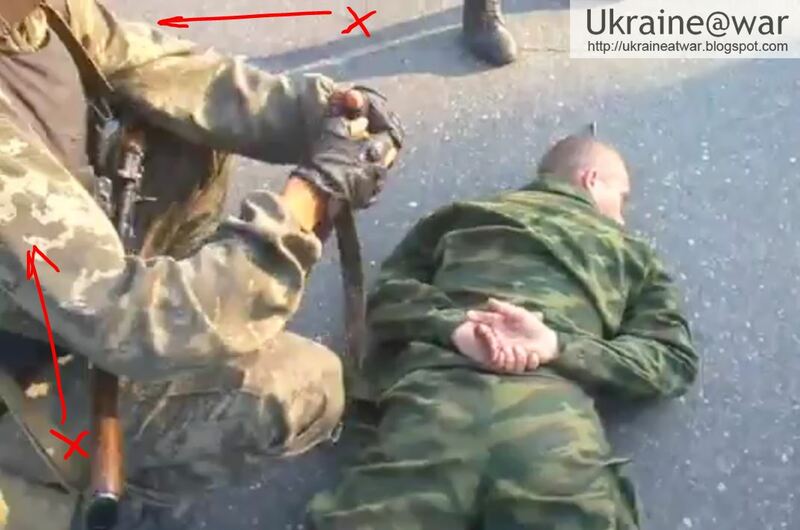 To kill Ukrainians?" Ukrainian would not ask this way. Everything "smells" by cheap film production.